With the arguments over disputed islands and reefs in the South and East China Seas getting louder and louder, it is only natural there would be increased media coverage on the People’s Republic of China’s (PRC) military capabilities. Unfortunately, the confusing and often-inaccurate information on the technical aspects of China’s armed forces, and in this particular case the People’s Liberation Army Navy (PLAN), makes meaningful debate difficult. One especially troublesome example is the inadequate reporting on China’s anti-ship cruise missiles (ASCM), and more specifically the Ying Ji-8 (YJ-8) or Eagle Strike-Eight anti-ship cruise missile family. The purpose of this article is to conduct a critical review of the available evidence to sort out the correct identity of the members of this missile family, as well as providing accurate characteristics and performance data. One of the major causes of confusion surrounding the YJ-8 family is the myriad of designations for the various missiles and their relationship to each other. Unfortunately, many of the designations out in the mainstream press are incorrect, which makes it very difficult to link a PLAN designation with the appropriate export version. Table 1 presents a summarized list of the published designations, their relationships, and accuracy. Table 1: PLAN and export designations for the Eagle Strike-8 family. A single red entry in either designation column indicates an incorrect designation. If both entries are red, this indicates that either both designation entries are incorrect, as in the case of the YJ-12 and the C801A, or that an incorrect relationship or linkage has been made between correct designators (e.g. YJ-82 and C802). As it can be seen from the above table, only one designation pair is correctly identified and linked – no wonder there is so much confusion in current publications. Clearing up this designator confusion is essential to understanding a missile’s true identity, and for whom it was made, the PLAN or the export market. This is an important distinction, as the PLAN doesn’t use missiles with a C800 series designation; all the missiles on their warships, aircraft, and submarines use the YJ-8 series designation, as we will see shortly. Before we can begin to untangle this knot, there has to be a clear understanding as to what type of missile is being discussed. To accomplish this, some basic recognition features are provided to assist in missile identification. 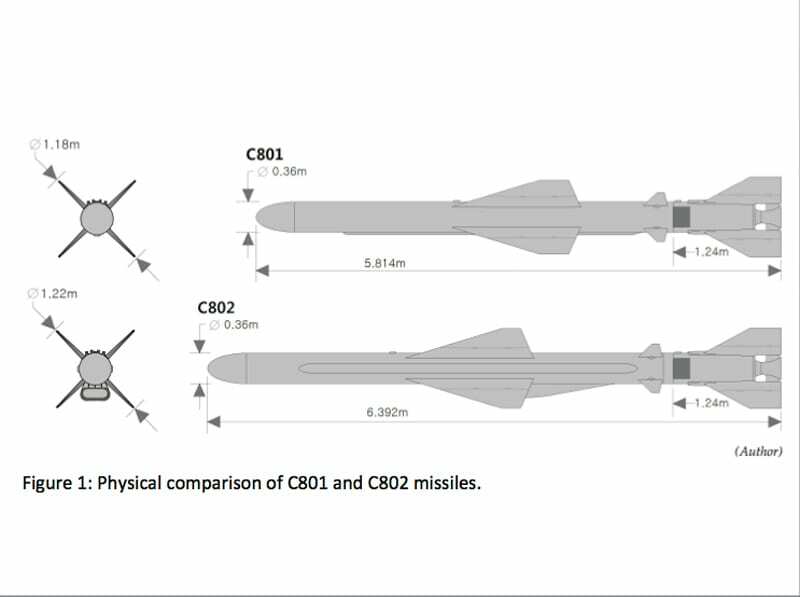 Figure 1 compares the physical characteristics of the C801 and C802 export missiles based on brochure data provided by the China National Precision Machinery Import & Export Corporation, or CPMIEC. All members of the YJ-8 family closely follow one, or the other, of these two missiles. There are three significant recognition features that need to be highlighted. First, the C802 has a longer fuselage section aft of the wings, a necessary modification to accommodate the TRI 60 series turbojet. A second related identifier is the pronounced inlet scoop on the C802 for said turbojet. An inlet scoop is unnecessary on the shorter C801 as it is fitted with a solid rocket motor for propulsion. And finally, there are two external cable runs on the C802, located on both sides of the missile, while the C801 has a single cable run on the missile’s underside. Of note, some photos of the air-launched version of the YJ-83 lack cable runs. These photos are of dummy training missiles that do not require an electrical connection between the missile’s flight control computer and rudders. 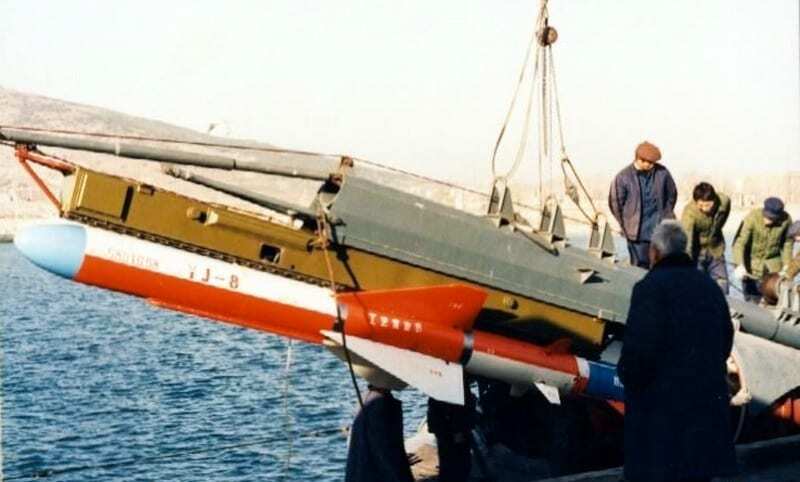 The YJ-8 was a radical departure from the Soviet P-15 (SS-N-2) Styx-based missiles that were the mainstay of the PLAN’s arsenal throughout the mid-1990s. Considerably smaller and lighter than the Styx, the YJ-8 had essentially the same range and speed, but with a much smaller warhead. The key technological leap forward was the transition from a liquid-fueled rocket engine to a solid rocket motor. The approval to begin developing a small rocket-powered ASCM was granted by the Central Military Commission in September 1976. The decision to use a solid rocket motor was based on encouraging results from laboratory tests since 1973 and the preliminary work done on the SY-2 (Upstream-2) ASCM. According to a 1991 Aerospace China article, the development of the actual YJ-8 propulsion system began in 1978, with flight-testing completed by 1985. The YJ-8 reached initial operational capability (IOC) with the PLAN in 1987. Although first announced in 1984, the export version of the YJ-8, the C801, wasn’t formally introduced to the international arms market until three years later. This initial version had fixed wings and was stored in small externally ribbed box launchers on surface ships, or in external tubes on a single modified Type 033G Romeo class submarine. Figure 2 shows a YJ-8 missile being loaded into one of the tubes on the modified Romeo. The origins of the YJ-8 are somewhat shrouded in mystery. Several defense analysts have suggested the YJ-8 is a reverse engineered copy of the French MM38 Exocet. The general appearance of the missile, and the externally ribbed launcher, was cited in support of this theory. Other analysts and commentators disagree and argue the Chinese missile was a logical result of the development of a weapon system with similar requirements. The analysts that hold this view point to the differences in the size of the two missiles, and the significant disparity in rocket motor designs. The MM38 uses a sustainer and booster that are housed within the missile’s body, while the YJ-8 uses an internal sustainer motor with a separate, jettisonable booster. The independent development hypothesis is difficult to support today given our knowledge of the PRC’s weapon acquisition and development strategy. China has perfected the practice of acquiring weapon systems, openly or covertly, analyzing them, and then developing indigenous versions. This is a necessary evil when a country has to close a significant gap in military capabilities within a short amount of time, and with limited resources. A better argument to support the theory that the YJ-8 design was at least heavily influenced by the MM38, if not a highly modified copy, is to look at the two missiles’ operational characteristics; the YJ-8’s are almost identical to the MM38. Range, speed, and warhead size for both missiles are virtually the same, but the most significant aspect is the flight profile. The French MM38 was the first sea-skimming ASCM, with a highly advanced (for the day) radar altimeter and flight computer. For China’s immature industrial base to successfully replicate the Exocet’s revolutionary flight profile in less than ten years (1976-1985) strongly implies they had access to proven technology. An article in the Shipborne Weapons journal (Volume 5, 2008) suggests this was the case, as the author states that the Chinese were quite interested in purchasing Exocet missiles from France. Unfortunately, the price the French wanted was too high and the deal was shelved, at least temporarily. The author doesn’t explicitly say whether or not a Chinese purchase of the MM38 eventually occurred. He does say that the flight control system gave Chinese experts “great inspiration.” Therefore, it is probable that the Chinese had either somehow acquired an Exocet missile, obtained individual flight control components, or at least had access to highly detailed production schematics early in the YJ-8’s development. Beginning in the early 1990s, numerous publications referred to the YJ-8 as the YJ-1, claiming that this was related to the C801 export designation. This is an incorrect assertion, as photographic evidence shows the YJ-1 is the PLAN designation for the unsuccessful C101 supersonic ASCM. The YJ-8A appeared very quickly after the YJ-8 entered service, reaching IOC in 1992 or 1993. In fact, the YJ-8 was only deployed by the PLAN on the Jianghu III (Type 053HT) frigates Huangshi (Hull 535) and Wuhu (Hull 536), as well as the single Type 033G modified Romeo class submarine. The only known recipients of the export version of the fixed-wing C801, with the externally ribbed box launchers, were Thailand’s four Jianghu III frigates and Yemen’s three Hounan (Project 021) missile boats. The rationale for the limited fielding of this brand new weapon has not been made public, nor have there been any reports of technical problems or dissatisfaction with the YJ-8’s performance by the PLAN. Indeed, historical accounts of the YJ-8’s development published in the early to mid-1990s indicate the flight tests were quite successful. 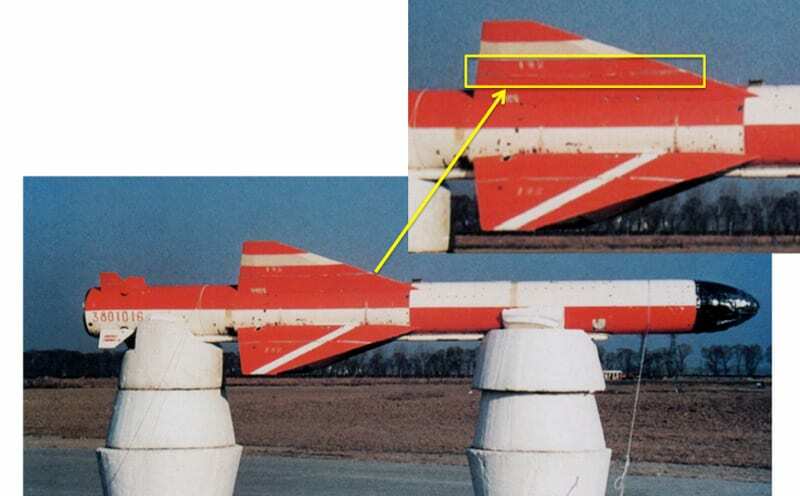 The only physical difference that is readily visible is that the YJ-8A had wings and booster fins that folded (see Figure 3), permitting the missile to be stored in an even smaller, non-ribbed launch container. Of note, both the C802 and YJ-83 would also use the same container, as it was specifically designed to hold folding wing missiles. The change in launch canisters went largely unnoticed by Western defense publications, and subsequently so too did the deployment of the YJ-8A. Some ten years later, articles started popping up on an extended range version of the C801 using the designations YJ-12, YJ-81, and C801A to describe this missile. Both the extended range assessment and the majority of the designations are inaccurate. The YJ-12 designation basically means YJ-1 Mod 2 in Western nomenclature. As has already been discussed, the YJ-1 is a very different missile from the YJ-8 family, and the repeated references to the YJ-12 being supersonic harken back to its true origins. The YJ-81 designation, on the other hand, is a valid one. However, it is the designation for the rocket-propelled, air-launched member of the YJ-8 family, as we will see in the next section. The C801A designation has been used repeatedly to describe the export version of this new longer-range missile. This makes some degree of sense; if the YJ-8 is the C801, then the YJ-8A must be the C801A. The problem with this assumption is the C801A designation has never been seen at arms shows. CPMIEC mockup displays, placards, and brochures seen throughout the 1990s and into the early 2000s (the C801 disappeared from the major shows after 2003) never used this designation. In every circumstance, the designation displayed was C801. Figure 4 shows a mockup of a C801 missile on display at the CPMIEC booth during an arms show in 1998, the C801 designation is clearly visible. The argument that the YJ-8A has a longer range is also not supported by CPMIEC placard and brochure data. In all characteristics and performance aspects, including maximum range, both the fixed wing and folding wing versions of the C801 (aka YJ-8 and YJ-8A) are identical. In addition, if the YJ-8A truly had a greater range, one has to ask the question why wasn’t the extended range capability also integrated into the YJ-81 and YJ-82 missiles? An extra 28 to 48 km of range would be tactically significant, particularly for an aircraft attempting to penetrate the outer air defenses of a ship or formation. Furthermore, an aircraft with even a moderately capable surface search radar could actually employ the weapon out to near its maximum range. Up until about 2002 or so, the PLAN did not have an indigenous shipboard sensor system that could support over the horizon targeting. Such a targeting system would be necessary for the YJ-8A to be employed against targets at a range of 50 km or more. Still, the vast majority of the standard references, articles, and blog postings consistently hold the C801A as having a maximum range of 70 to 90 km. This claim appears to stem from an unspoken assumption in Western journals that since the C801 was considered a reverse engineered MM38 Exocet, then the C801A with folding wings was a copy of the MM40, which has a range of 70 km. The French, by the way, had to add 0.6 meters to the MM40’s length to accommodate the necessary additional fuel. Given the YJ-8 and YJ-8A have the exact same length, the proponents of this argument assert the Chinese came up with a new high-energy density solid rocket fuel. This assertion is weak from a both a technological and programmatic perspective. The Chinese aerospace industrial base was still in its infancy in the late 1980s, and relied heavily on technological assistance from other nations. Propulsion systems in particular were a significant weakness, one that China has struggled with for decades. Research into solid rocket propellants had started in the mid-1960s, and by 1977 the Chinese had developed a fuel that worked reliably, but represented only the state-of-practice from a technology perspective. It would take another eight years to complete the design and testing of the original YJ-8 rocket motor. To suggest the Chinese had developed a new higher performance solid rocket fuel, tested and deployed it in a modified YJ-8 missile in less than seven years strains credibility to the breaking point. And while translated historical accounts of Chinese weapon systems developments are by no means complete, there is no mention of a new propellant for the YJ-8A in what is available. Even if the technological leap wasn’t an issue, programmatically the Chinese had already decided on a non-rocket solution for extending their anti-ship cruise missile’s maximum range. 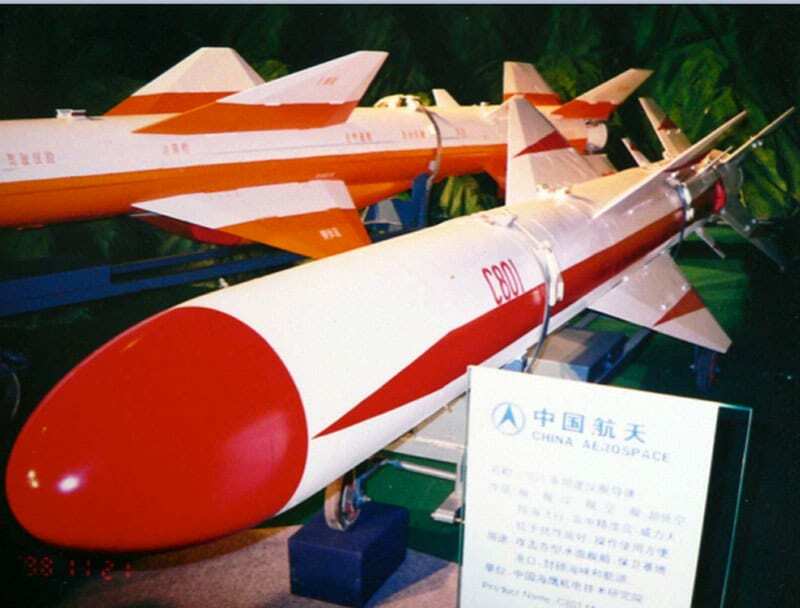 By the time the YJ-8 had reached IOC in 1987, the Chinese were already committed toward developing an air-breathing engine for the follow-on missile design that would eventually become the C802 and YJ-83. Christopher P. Carlson is a co-designer of the Harpoon tactical naval wargame and a bestselling author.